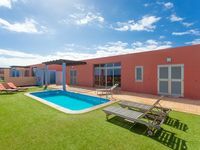 Properties in Fuerteventura average 4.6 out of 5 stars. VILLAS TO 20 METERS FROM THE SHORE OF THE SEA, WITH PRIVATE POOL. Property 3: VILLAS TO 20 METERS FROM THE SHORE OF THE SEA, WITH PRIVATE POOL. 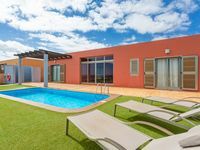 Apartment with sea views in Corralejo, palm garden, terrace and 3 pools. Property 4: Apartment with sea views in Corralejo, palm garden, terrace and 3 pools. Property 6: Top bungalow, Tempormatratze 2x2 m, garden south facing, quiet settlement, wlan incl. Property 23: Large bungalow w/private pool, few min. from the sea, protected inner courtyard. Only 1 meter from the beach! Beach bungalow for 6 persons! Children free! Property 41: Only 1 meter from the beach! Beach bungalow for 6 persons! Children free! VILLA WITH HEATED PRIVATE POOL , WIFI, BBQ, 5 MIN WALK TO BEACH AND LOCAL SHOPS. Property 42: VILLA WITH HEATED PRIVATE POOL , WIFI, BBQ, 5 MIN WALK TO BEACH AND LOCAL SHOPS. LUXURY VILLA WITH WONDERFUL VIEWS TO THE SEA, HEATED POOL. Property 50: LUXURY VILLA WITH WONDERFUL VIEWS TO THE SEA, HEATED POOL. Great location, nice view of the ocean, large spacious cottage, I recommend.